Since our last Premos newsletter was published, we have made great strides in the further development of the machine. In this issue we will spotlight the changes, modifications and improvements we have implemented in the meantime. In our last issue, we explained that we had to increase the diameters of the die rollers from 800mm to 1000mm on the two 2016 machines. These modifications have had a very positive effect in terms of throughput and pellet quality. In increasing the roller diameters, we also had to rework their connections to the main gearbox. This in turn eliminated a problem that had popped up in the 2016 trials. Yet unfortunately, the bigger rollers also impose higher loads on the main gearbox, and this presented us with a new challenge in the 2017 trials. In the 2017 season, we therefore mounted the machine on a tandem axle, which brought a number of benefits – substantially higher axle load reserves and better tracking, especially at higher speeds on public roads, but also on soft ground in the field. In terms of machine operation, we have now installed a comprehensive system of KRONE software and hardware so that the machine is no longer operated by means of measuring equipment. 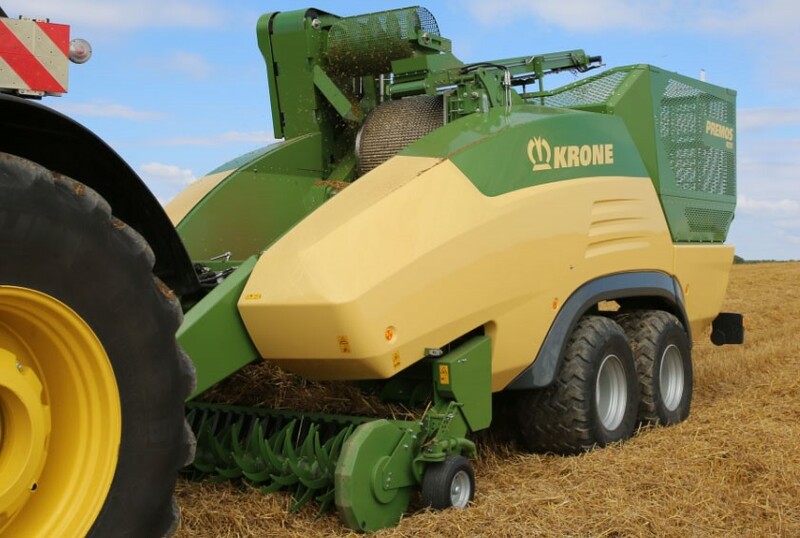 The KRONE components give us a much more intuitive user interface and make operating the machine much more convenient. The oil is now supplied by a load-sensing system, and all hydraulic functions are controlled from the operator terminal. We brought down the transport height by modifying the elevator that fills the hopper. This modification also brings clear advantages when filling the pellets into trucks. The panels, too, were updated to meet the requirements of field work. The top of the headboard is curved now, which substantially reduces the amount of dust, chaff and straw that collect here. In the 2017 season, we were able to trial three machines in the field, testing all the features described above. It was not uncommon for us to achieve throughputs of 5 tonnes per hour. On one day, the machine produced 45 tonnes of pellets in 9 hours. With reference to the stationery use of the machine, we have made great progress on the bale splitter which is still being trialled and continues to give us quite a lot of homework. The German company Kalverkamp Innovation has preliminary thoughts about designing a pellet machine that can also be used as a mobile unit. This machine is to implement a new pelleting process that dispenses with the power-sapping chopping phase and that is able to pellet any type of field product such as straw and hay. The company builds the first functional test model. Kalverkamp Innovation contacts Maschinenfabrik Bernard Krone with a proposal for a mobile pelleting machine. Maschinenfabrik Bernard Krone had been entertaining the idea of entering the pelleting market for a number of years, but had not initiated the R&D process because of lack of capacity. A contract between Krone und Kalverkamp is signed in the same year. After the first trial model is built to test the general pellet-making technology, a stationary unit is built and commissioned in February 2013. This unit is to test whether the system is also viable in large-scale operations. At the beginning of the year, the developers start designing a mobile unit while the stationary unit is being built. The machine is assembled in May and the first mobile unit goes to the field in July 2013 – just in time for the straw harvest. Based on the experience of the 2013 trials, the 2013 unit undergoes comprehensive re-engineering so that the 2014 unit, which is assembled from May 2014, reflects all these modifications. This unit is put to the field in July 2014 after the individual assemblies were trialled separately. Development work on the 2014 unit continues and is based on the experience gained in the 2013 season. Styling, too, is becoming an issue now. A second machine is assembled in May, which allows us to trial two machines in the 2015 season. 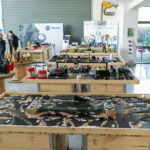 The first product videos and photos are shot to promote the machine for Agritechnica 2015 where it will be presented to the world for the very first time. Initial experience is also gained in hay and lucerne in addition to straw. Not long after, the developers agree to concentrate on these crops as they continue developing the machine. The 2016 season sees two more machines entering the field. These have much bigger die rollers, with diameters increased from 800mm to 1000mm and the surface area thus by 25%. This means that the pellets stay longer in the holes and the angle at which they are fed into the rollers is much wider; the input power drops too. This leads to a better pellet quality and increases throughputs substantially – up to 5 tonnes of straw per hour. In the same summer, the machine is presented to the press during a field workshop that is held in Hungary. Although the material was too wet, we produce lucerne pellets in front of the invited journalists. Two new machines are built for the 2017 season. The two prototypes from 2016 with the bigger die rollers are modified to match the 2017 build. 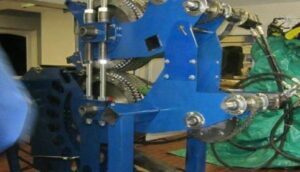 In addition, the machines receive a new main gearbox that is able to cope with the higher torques and has a re-engineered connection to the die rollers. The axle is a tandem axle now to accommodate the higher roller and gearbox weights. The control system, too, makes great progress, and the Krone software and hardware is installed for the first time. Operation is much more intuitive now, and all functions can be controlled from the operator terminal. From now on the oil supply is load-sensing, which makes attachment to the tractor much easier. The GRP panels have been modified and collect less material now. One of the first field sites where Premos is put through its paces this year is in Denmark. After that, the trials continue. Unfortunately, they present us with a number of challenges which force us to postpone the market launch planned for the 2018 season for another year. We learn many new things about pellets every day. In many conversations with experts and seasoned pellet users, we have learned that a pellet is not just a pellet. 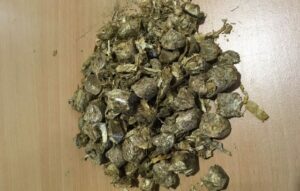 For one thing, the pellets we produce are completely different from other products on the market. This is because our 60mm diameter product is made from material that is not chopped before it is pelleted and because it is more reminiscent of woodchip. For another thing, we learned that different applications also call for different qualities of pellet. Straw pellets that are destined to fuel power plants should be as hard as possible and contain no fine material. To make such a pellet, it is best to use rather wet straw and to separate the fine material from the pellets in the sieving drum. By comparison, pellets that are used for bedding must not necessarily be really hard; on the contrary, these customers ask for fine material, and sometimes they even break the pellets to make them more absorbent and easier to dose. 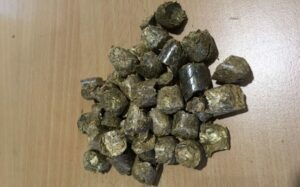 Whole pellets are much too hard and large for use in poultry farming, e.g. with chicks. To produce pellets for poultry farms, it is best to harvest dry straw at higher throughputs. The less time the pellets spend in the die holes, the less the material sticks together. 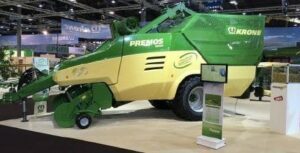 Premos is able to produce pellets to individual requirements simply by varying the amounts of water or vegetable oil that are added at the beginning of the process. Using more water means the resistance in the holes increases and the pellets become harder. Using more vegetable oil means the holes are more slippery, the resistance drops and the pellets become softer. Metering the correct amount of liquid into the machine is usually only necessary at the beginning. There are further options to control the size of pellets. This is done by adjusting the scrapers in 10mm increments from 10mm to 60mm, which is done without tools. In our last newsletter, we showed how the pellets make excellent bedding in hen houses. In the meantime, we have tested them in many other applications and the experience has been extremely good. The high pressure that is applied during the pelleting process fractures the straw, so it is more easily degraded by the bacteria in the fermenter, which leads to much higher gas yields than you would get from short straw chops. In addition, the pellets are heavier than water and do not float in the fermenter. The major drawback is that the current production costs do not justify using pellets exclusively for the production of biogas. However, if used as cattle bedding or in combination with sugar beet chips before they are taken to the fermenter, pellets would free up many hectares for growing silage maize. After they serve as bedding, they become a much more interesting option for biogas producers. Pellets make for dry and comfortable bedding in cubicles where their enormous liquid absorbing capacity comes into its own. Yet they are not equally suitable for all types of animal housing. If they are used as deep bedding material (approximately 20cm deep), it is best to wet the surface of the pellets to soak the surfaces slightly and make them softer. Pellets have better cushioning qualities than cut or chopped straw. In fact, a comparison test showed that cows preferred those cubicles that were bedded with pellets over those filled with straw. Another advantage is that the rear end of cubicles stays drier, which should have a very positive effect on udder health. We also observed that the bedding lasted longer, which of course reduces the amount of straw used for bedding. 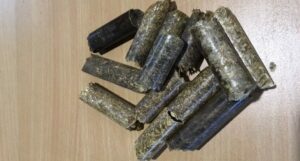 A test in deep-bedded cubicles with rubber-matted bases produced similar results, but here the layer of pellets was of course thinner (approx. 8cm) and this was not enough to make a firm base. The test in cubicles where the base did not allow for deep bedding was stopped, because here it was not possible to form a comfortable bed with the pellets. In these cubicles the pellets did not give the necessary cushioning effect and too much material was lost by cattle movement. 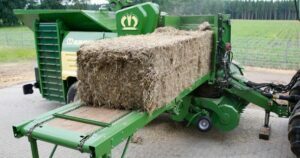 The amount of straw that is used to make adequate bedding with pellets is substantially smaller than when using baled straw. Using cut straw, the daily demand for straw was approx. 350 – 400kg. By comparison, using pelleted straw with its excellent absorbing quality reduced the demand to 150kg/day. The dark, peat-like cushioning in the lying area took some getting used to at the beginning. 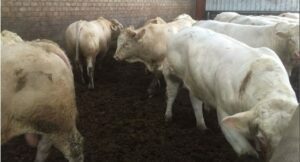 But the bedding was always dry, and this became evident when looking at the white coated Charolais bulls.